When it comes to past presidents...Abraham Lincoln was and will always be my favorite president of the United States. He was born on February 12th, 1809 and died on April 15th, 1865 when he was assassinated by John Wilkes Booth. He was the 16th President of the United States from March 4th, 1961 through April 15th, 1865. If you're a fan of President Abraham Lincoln, you've got to visit Gettysburg, Pennsylvania. You'll find all kinds of Civil War era attractions that are geared towards our beloved president. You can learn about his birth, his political career and his death. In case you didn't know, he was part of the Whig Party and then moved into the Republican Party. My wife and I enjoy visiting Gettysburg a few times every year and today I wanted to share some of the President Lincoln historical facts, statues, memorials, etc. with all of our readers. All of the ones that we're featuring are part of the exhibits located at the Gettysburg National Military Park Museum. 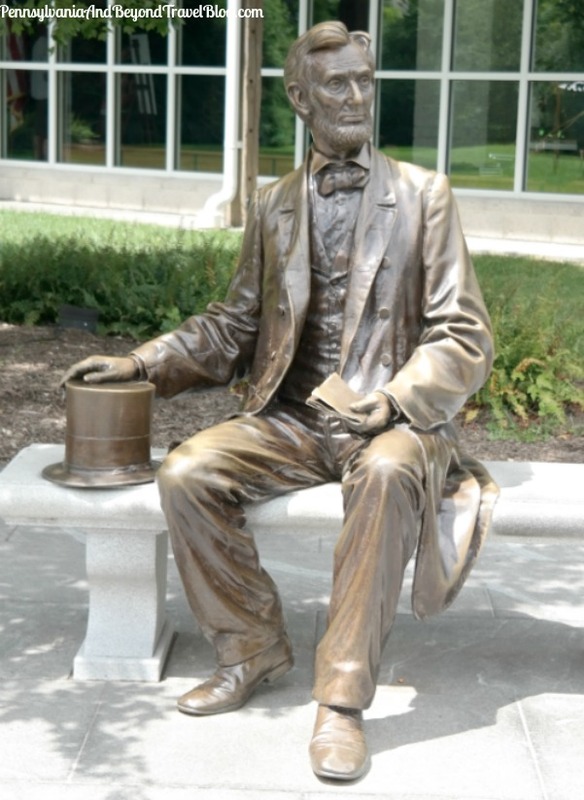 Located to the left of the sculpture you'll find a large boulder which has a plaque on it with the wordage of Lincoln's famous Gettysburg Address. If you're looking for the official Gettysburg Address spot and historical marker, you'll find that located on the top of a hill in Soldier's National Cemetery which is a short drive away. Once you're inside the museum you'll find all kinds of different historical exhibits that are dedicated to President Abraham Lincoln. They have a little bit on his early life, a lot of exhibits and information on his role during the Civil War and the Battle of Gettysburg and then they have a few exhibits that cover his assassination and death. You can learn about the Emancipation Proclamation that he signed, the famous Gettysburg Address speech and you'll see replica's of his assassination newspaper announcements. The museum has an extensive collection of Lincoln memorabilia, so if you're a fan of his, a presidential or a civil war history buff, you'll find plenty of exhibits and information to sink your teeth into. As you can see, there is a lot to see and learn about President Abraham Lincoln when you visit the Gettysburg National Military Park Museum in Gettysburg, Pennsylvania. Today we wanted to just give you a sampling of the things you'll see and learn during your visit. I would really enjoy learning more about Lincoln by visiting the exhibits and sites at Gettysburg. I too find him to be my favorite President.